When is an airline a critical part of the healthcare system? If you ask people about what it takes to ensure medicines quality, most answers focus on how a medicine is manufactured. But there’s more to the story. The conditions under which medicines are transported and stored also have a critical role in medicines quality. This role is all the more urgent when the lives of mothers and children are at stake. Ethiopian Airlines transports a major share of the medicines imported to Ethiopia, and its efforts to safeguard these medicines demonstrate how a transportation company can help protect public health. The airline recently upgraded its infrastructure capacity to protect the quality of medicines during transportation and storage. As part of ensuring good storage and distribution practices, capacity building training was also provided to Ethiopia Airlines staff, in partnership with the Promoting the Quality of Medicines (PQM) program, funded by the U.S. Agency for International Development (USAID) and implemented by USP. Transporting medicines may sound simple, but it requires more than merely getting products from point A to point B. Many medicines are very sensitive to environmental factors, such as temperature and humidity, which can change beyond acceptable limits during transport in an airplane’s cargo hold. To maintain and protect medicines quality, airlines must follow the standards set in good distribution practices (GDP) and good storage practices (GSP), including International Air Transport Association (IATA) temperature control regulations for time-sensitive and temperature-controlled pharmaceutical cargo. As in many sub-Saharan countries, Ethiopia’s pharmaceutical manufacturers have limited capacity to produce essential medicines according to international good manufacturing practice standards to meet local public health needs. As a result, the nation must import many essential medicines, including those used to treat malaria and HIV/AIDS and to protect the health of mothers and children. To protect medicines quality, Ethiopia’s Food, Beverage and Pharmaceutical Industry Development Institute (FBPIDI) asked PQM to train Ethiopian Airlines cargo staff on how to follow these important procedures. PQM has been working with Ethiopia’s health authorities since 2009 to ensure the quality and safety of medicines—especially medicines used to treat malaria and protect maternal and child health. Its assistance focuses on strengthening quality assurance and quality control systems, to help maintain and protect quality from the time a medicine is manufactured until it reaches the patient. These activities in Ethiopia are also funded by the President’s Malaria Initiative (PMI). PQM’s specialized training, held in June 2017, included 10 cargo service team members of Ethiopian Airlines. As part of the training, attendees toured a local manufacturer’s warehouse to observe GDP and GSP in practice, reinforcing the concepts learned in the classroom. The benefit of this effort to other countries in Africa is also important to appreciate, as the airline provides similar services to many of those countries, according to Jude Nwokike, Senior Director of PQM. “PQM is committed to working with partners throughout the supply chain to help protect the quality and integrity of life-saving medicines,” he adds. 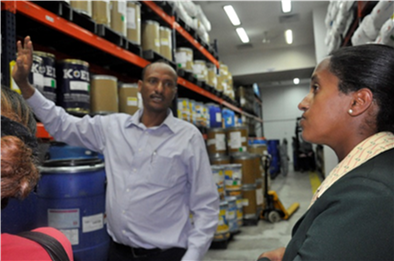 Ethiopian Airlines’ commitment to ensuring medicines quality goes beyond participating in the training program. PQM recently visited the airline’s new state-of-the-art cargo terminal, complete with a large cold-storage facility designed to safeguard the integrity of temperature-sensitive medicines. As part of its mandate to help strengthen Ethiopia’s medicines quality assurance systems, PQM will collaborate with FBPIDI to keep in touch with the airline, in the event that additional training is needed. The airline shared its appreciation with PQM. Mr. Berhanu Kassa, Director of Global Cargo Sales and Services for Ethiopian Airlines, told PQM that their guidance and training on best practices helped the airline optimize use of its new cargo facility to protect the quality and integrity of the medicines it transports. Learn more about Promoting the Quality of Medicines program.